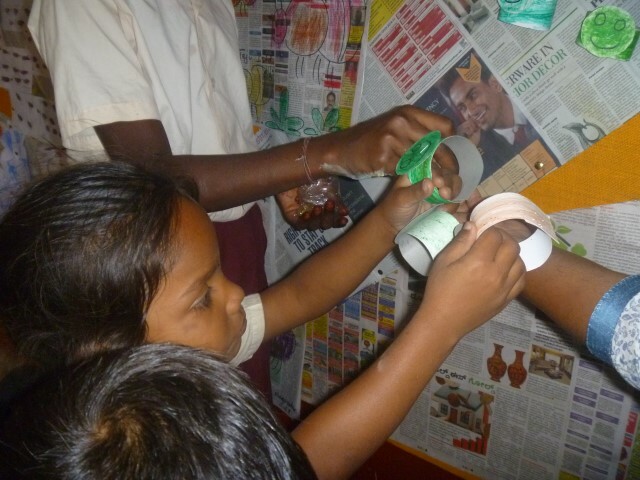 Interactive activities improve levels of learning. This simple axiom has motivated the Shabd Majaa programme. Shabd means ‘sounds’ and Majaa means ‘fun’. Together, Shabd Majaa Boards attempt to capture the fun that is possible when playing with sounds, words, stories, riddles, poems and other aspects of broader language. 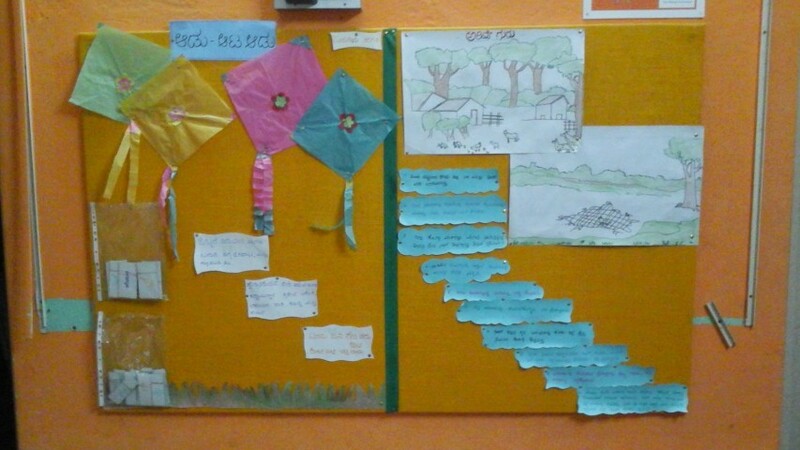 A Shabd Majaa Board is first of all an attractive visual display on a selected topic. The topic may be a folk tale, a topical theme like ‘diwali’ and ‘rainy season’, a serious theme like ‘electrolysis’ or ‘fashion’, or an exam theme like ‘chemical bonds’ and ‘modes of transport’. 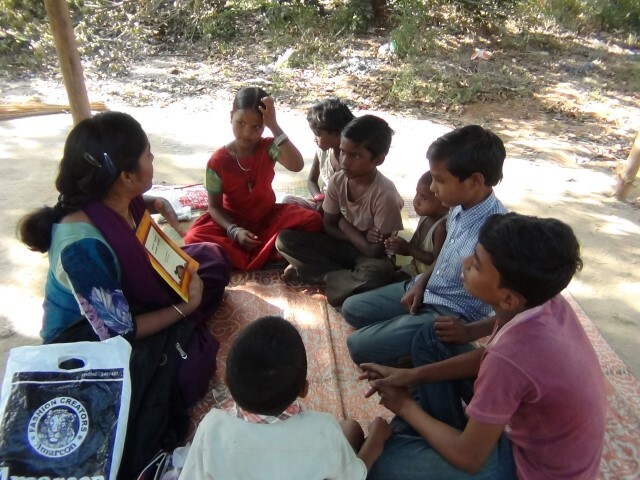 The central illustration is supplemented with reading materials tailored to the level of participating children. 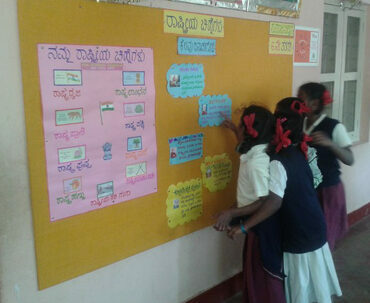 We have found children helping each other to access the material displayed on the Shabd Majaa Board and we therefore exploit this cooperative learning process in children’s engagement with our materials. 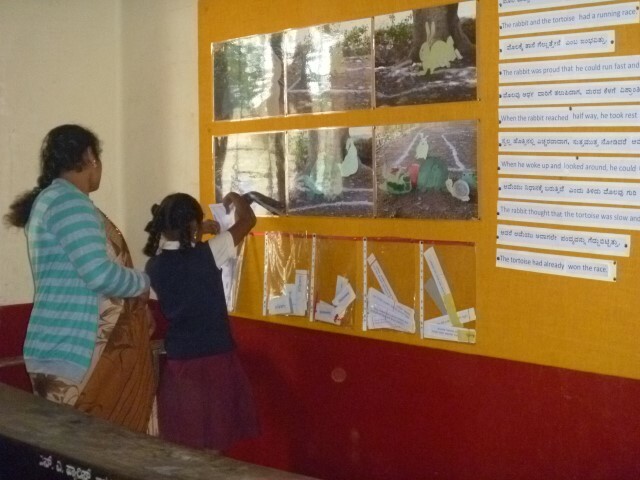 We have found the Shabd Majaa Boards to be a useful location for depositing a variety of learning activities. We do this by placing a series of activity packets at the bottom of the board. These activity packets have word cards, picture cards, story cards, teacher-authored books, child-authored books and, more rarely, commercially bought materials. The materials we place in these packets are developed to meet specific literacy-learning targets. These include word-building activities, concept matching activities, talk and discussion activities, narrative writing and publishing activities, and extended reading activities. An important target in the add-on materials with a Shabd Majaa Board is to promote inference making and deepen comprehension on the selected topic. 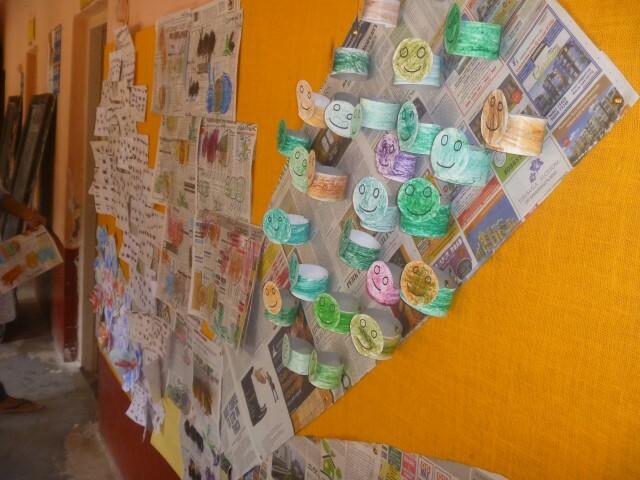 The Shabd Majaa Boards are particularly effective when teachers are struggling with transacting the curriculum. These may be teachers who are also showing a lack of comprehension of child-focused methodologies and education philosophies (e.g., an activity-based textbook, a continuous and comprehensive assessment scheme). The Shabd Majaa programme appears to also be a visible and easy to understand teacher support system in schools where there is infrequent or absent mentoring of teacher in the new methods of teaching. These boards clean up the clutter on classroom walls, and force the posters unlinked to the ongoing lesson to be stored away. These boards stop the practice of placing posters out of the eye level of the child. The displays allow for a graded introduction of concepts. The displays and associated activity packs allow for independent learning opportunities for each child. Some teachers experience this as freeing up time to focus on those who need more targeted inputs. We have found a particularly quick resonance to Shabd Majaa Boards from teachers who wish for a quality classroom environment but are lax or unable to put in the effort needed to do so. 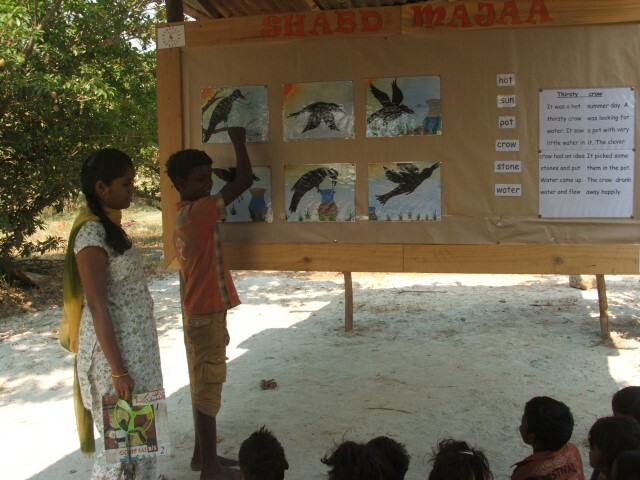 Shabd Majaa is an interactive board that may be placed in the classroom or in the community. 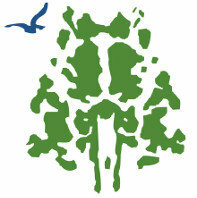 It carries materials designed to improve children’s oral and written language. We have found Shabd Majaa Boards to be a valuable focal point within a community. The Board becomes the place for children to congregate. In some places the boards are close to their play areas, and can become a playground board. 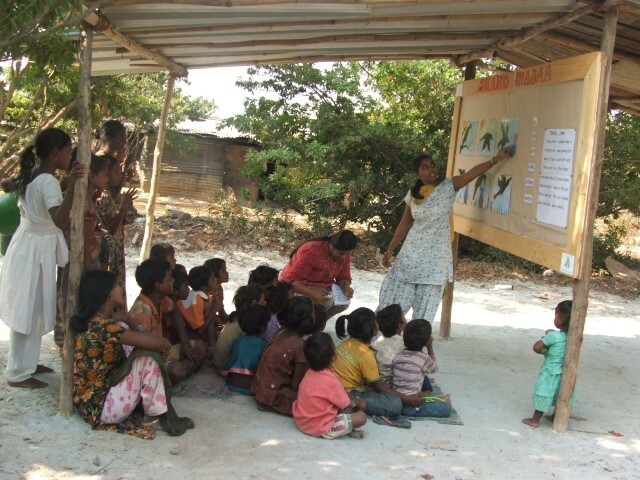 These boards lend themselves to changing the literacy environment in the child’s neighbourhood. 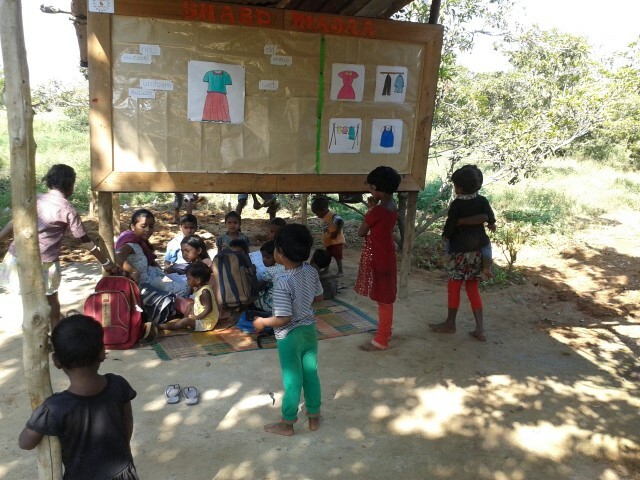 The interactive board includes materials designed to improve oral and written language such as stories well known to the children in the settlement. The stories are presented in picture form. This is supplemented with cards carrying the key words of the story. Once in 10 days, PAL specialists from Promise visit the settlement with new story material. The story cards are put in sequence and the illustrations are discussed in detail, with English vocabulary being the focus. 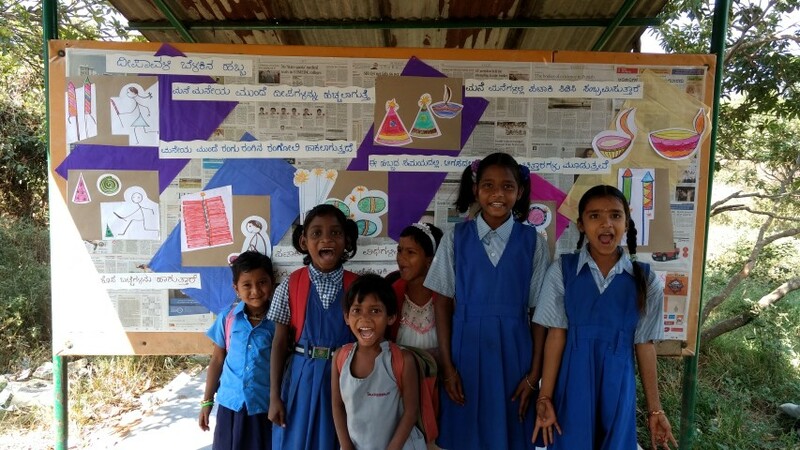 Children attempt story telling in their home languages—Kannada, Hindi, Assamese, Bengali, Tamil—and the teacher attempts to rephrase the narration in English. Children of all age groups who are left unattended in the settlement attend the sessions. We have noted increase in children’s interest to learn to read and increase in awareness amongst parents, of the need to send children to school. A Big Jump, a Big Change? 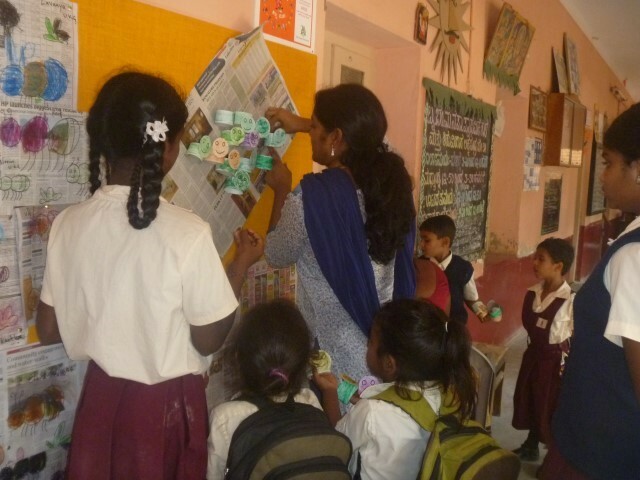 A first-level analysis of Shabd Majaa suggests that the programme helps go past an acknowledged road block to all children learning – that of encouraging interactive communication and independent practice. The boards remove a critical barrier to solving an important education related problem. There appears to be an ease in integrating the idea within existing school systems and within community spaces. With uptake from a variety of contexts being modest to high, the Boards have a potential for scalability. Similar to the challenges of infusing any teaching-learning materials into low-functioning school systems (e.g., flip charts, books for library), the Shabd Majaa Board needs to be supported with intensive training and sustained supervision. Our impression from using the programme in multiple contexts and with varied time-lines for integration suggests that the introduction of Shabd Majaa Boards can show substantial impact (a big jump, a big change). Finally, the programme is low in cost relative to supply of computer technology-dependent materials such as laptops and tablets. Out of the Book: Shabd Majaa in the Curriculum.